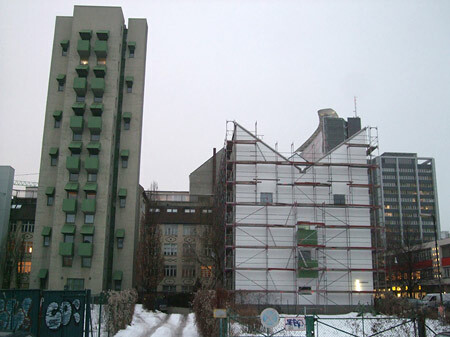 It has come to our attention that John Hejduk’s remarkable Kreuzberg Tower and Wings building (covered here by Karen Eliot in 2007) is currently undergoing a ham-fisted “renovation” job. This afternoon Jim Hudson of Architecture in Berlin, who has covered the building in some depth as part of his ongoing IBA odyssey, forwarded me a mail sent to him by none other than Renata Hejduk, daughter of the late John Hejduk. 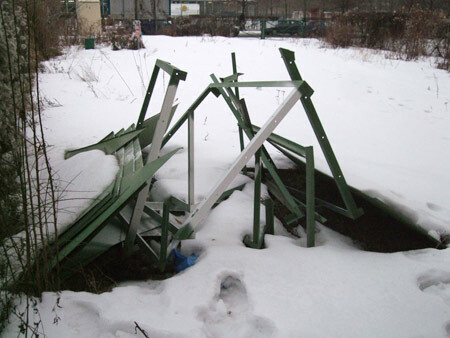 A friend of hers in Berlin had sent her the photos shown here, noting sadly “they cut the eyebrows away”. The façade is being painted white. The original balconies and awnings are already scrap and will be replaced by new orange purple constructions. The development company in question is the Berlinhaus Verwaltung GmbH, of whom this journal currently knows nothing. We strongly suggest all appreciators of architecture question them on this matter, and request open dialog. Today I contacted our esteemed colleague Kolja Reichert of the Tagesspiegel about the story, as well our our friends at Baunetz. We await reply. Can it really be that this city, which prides itself as being a culture capital, is not only happy to fill itself with the vacuous turds of property developers, but is also content to let the few genuinely interesting examples of (post/late)modern architecture that it has be disfigured in this manner by the same handful of philistines? To paraphrase Jim, who has so elegantly put it: if you also feel that architecture has more value than just real estate, then pass on the news and get people talking.